Balancing theory, step-by-step guidelines, expert advice, and practitioner experience, this book is a comprehensive why- and how-to handbook for developing a successful student-faculty partnership program. ALISON COOK-SATHER is the Mary Katherine Woodworth Professor of Education and coordinator of the Teaching and Learning Institute at Bryn Mawr College. 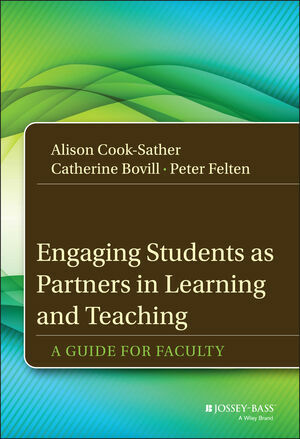 She publishes and presents widely on student voice and student-teacher partnerships. CATHERINE BOVILL is a senior lecturer in the Academic Development Unit at the University of Glasgow in Scotland. Her research and publications focus on students and staff cocreating curricula. PETER FELTEN is executive director of the Center for Engaged Learning and assistant provost at Elon University. His other books include Transformative Conversations: A Guide to Mentoring Communities Among Colleagues in Higher Education (Jossey-Bass, 2013).